Principal Nicole Walisser welcomes back all students for 2018/19. 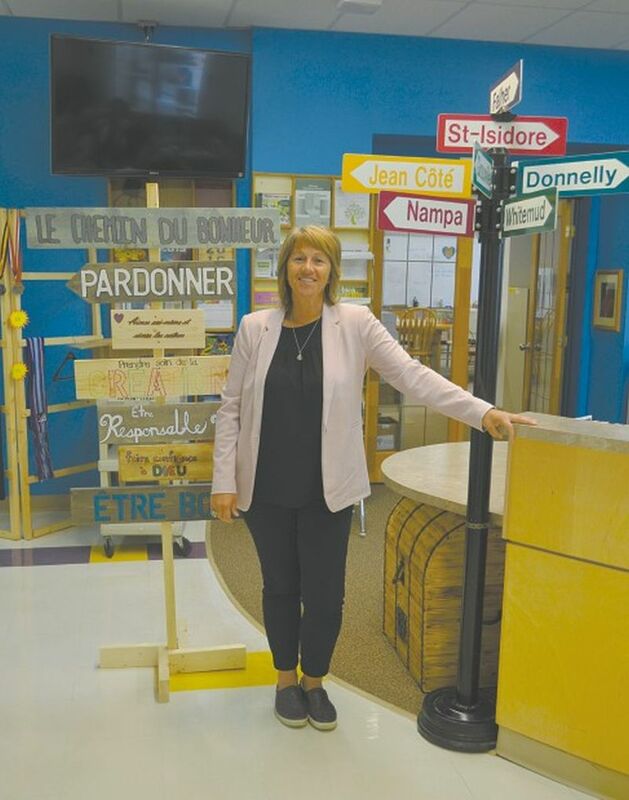 As the 2018/19 school year begins, École Héritage will continue to participate in the High School Redesign. Flex blocks are being introduced for Grades 7-12, which will incorporate mentorship for credits, study skills and sessions with ‘My Blueprint’, an online portfolio platform for students. Students will also learn how to acquire study skills. École Heritage is looking to expand its option courses with cosmetology classes in the second semester. Other changes are coming in 2018/19. For instance, more playground equipment will be added to the school grounds, which will be for pre-school age children. Also, the school is developing a wellness room for students, using art therapy. This project will be headed by teacher Chantal Roy and the CSNO Wellness Coach Cécile Coriolan. The school will be introducing the Alberta Government Nutrition Program for students in Grades K-6. All students in those grades will receive a free hot lunch. “In 2016-17, 14 school authorities across Alberta participated in a school nutrition pilot. A summary of the 2016-17 pilot was developed to highlight promising practices, innovative approaches and collaborative partnerships that have emerged. In 2017-18 school year the program expanded to include 62 school authorities. In Budget 2018, government continues its commitment to phase-in a targeted school nutrition program for elementary students in the province. $15.5 million is being allocated to the program in the 2018/19 school year. École Heritage’s athletics program is well in hand, and the rosters for the golf and volleyball teams will be finalized starting this week. James Bazan-Lindsay is the athletic director and one of the coaches. See a preview story about the school’s athletics program on Page 12 of this week’s Smoky River Express. Two students had some summer experiences. One was Nathan Fischer, who participated in the Encounters with Canada program. As found on their website at www.ewc-rdc.ca, youth ages 14-17 from across Canada to travel Ottawa to learn about Canadian institutions, meet famous and accomplished Canadians and learn about Canadian institutions, among other activities. Also, Meera Sylvain travelled to China during the summer to learn about their culture.